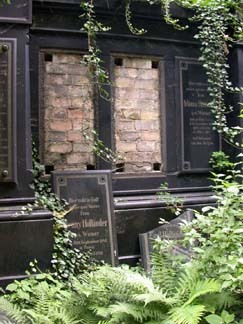 More than 115,00 Jewish Berliners are buried at the Judischer Friedhof Weissensee. The cemetery, established in 1880, has a place of remembrance for victims of the Holocaust and many victims of Nazi persecution are interred here. My wife's maternal grandfather was buried here in 1937. Images of the Weissensee by Diane Kaye are posted on Diane Kaye's website. All work on this site ©Harold Olejarz 1997 - 2003 and the artists credited. No images or text may be used for commercial purposes without written permission from Harold Olejarz. Personal or educational uses are allowed with permission from Harold Olejarz.